A liquid nod to the only pre-revolutionary tavern still standing in The City of Brotherly Love. “Man Full of Trouble” was one of Colonial Philadelphia’s first watering holes. This London Style Porter was brewed with “Old-World” in mind. Black and chocolate malts create its deep mahogany appearance and creamy espresso-like flavor. A blend of English East Kent Goldings and Fuggles hops lends a delicate earthy presence. A: A rich cola pour sits a fresh roast coffee color in the chalice, accompanied by a 1/2 inch rawhide leather colored head that was very well lasting. Solid structure, there was a good activity of carbonation slowly rising beneath, generously spaced. S: Some vanilla chocolate first appears on the nose, followed by a fresh, roasty chocolate-coffee offering. Earthy dark malts mix with some sweet cocoa and a faint hint of freshly charred firewood. Overall a good amount of indication and proportion of each, well represented. T: The flavor followed the nose with a rich roasted chocolate and lightly smoked cocoa sweetness with some charred wood bitterness to balance. Fresh wet silt, roasty wet coffee grounds with some lightly charred remains on the finish. Roasty spiciness, woodsy, with some smoked dark fruit rounds out. M: Medium build by style, light creamer texture, some smoky hints and charred character on the inner cheeks. O: A decent nose and flavor, the prize being the smoky charred finish that lingers and leaves quite an impression. Good solid drinkability. The clear dark mahogany brown beer pours out into a Duvel glass with a 1” fluffy dark tan head that recedes slowly but visibly to a ring of foam and a thin irregular island of foam while leaving a wide open web of lines and thin legs of lacing. Sipping creates a couple of arches and some widely scattered legs and patches of lacing that mostly cling to the sides of the glass. By about half way through the beer there’s only a thin ring of foam and some widely scattered small patches of lacing. The aroma has some coffee and dark chocolate along with some dark roasted malt character and a light bit of caramel. The flavors are much as expected from the nose and include some coffee, dark chocolate, a bit of caramel sweetness as well as just a bit of nutty character. There’s some lightly earthy dark roasted bitterness to balance but not entirely conceal the light caramel sweetness. The mouthfeel is medium bodied and fairly smooth with the finely bubbled, gentle but persistent carbonation. The finish begins with the fading of most of the flavors that leaves a dry ending that has some lightly earthy dark roasted bitterness that persists for a fairly long time. 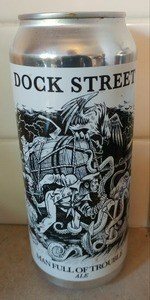 CANd now, the finale of the Dock Street portion of New 4 x 12 Stable Street Dock Hands Beer Sunday (Week 689)! The CANQuest (tm) has been highly successful this week. From the CAN: "30 IBUs"; "A liquid nod to the only pre-revolutionary tavern still standing in The City of Brotherly Love. 'Man Full of Trouble' was one of Colonial Philadelphia’s first watering holes. This London Porter Style ale was brewed with 'Old-World' in mind. Black and chocolate malts create its deep mahogany appearance and creamy espresso-like flavor. A blend of English hops lends a delicate earthy presence. "; "'It's okay to let go now. '"; "2017 Great American Beer Festival Bronze [Medal -] Brown Porter". I Crack!ed the vent & began a slow, gentle Glug as I had found, over the course of the day, that I had no idea what to expect. Once it was sufficiently decanted, I found that an in-glass swirl would raise three-plus fingers of dense, foamy, rocky, deep-tan/light-brown head with decent retention. The lacing on its exit was rather light, but it was of no matter. Color was Dark Brown to Very Dark Brown (SRM = > 27, < 34) with NE-quality clarity & deep-cola highlights. Nose was on the sweet side, with notes of burnt caramel and dark chocolate as well as black coffee & treacle. Mouthfeel was medium. The taste was advancing on sweet, but not quite broaching the hill. The taste CANtinued to evince a caramel & chocolate sweetness, but in the mouth, as it warmed, it took on a very chocolaty and earthy taste, more English than AmeriCAN, IMHO, but that was a mistake on the part of the original add. I am reviewing it as an English Porter, per the Notes. Finish was chocolaty, but quite dry with a lingering earthiness that made me want to visit the malt house. Yum! Dark brown in color with cola-like hues and very good clarity. Pouted with a short, soapy, dark beige foam with low retention. Dark, grainy malt and dark bread aromas with hints of nuts and roasted malt. Earthy, tobacco-like hop aromas. Medium bodied with medium carbonation and a very light creamy feel through the middle. Lightly roasted malt and earthy dark malt flavors up front followed by medium light, earthy, spicy hop bitterness through the middle. Brown bread, milk chocolate, sweet dark malts and light nutty notes from the middle to the end. Finished dryly with light spicy hop and sweet dark malt notes. This is more of an English porter than an American porter. Great malt complexity that is well balanced with earthy hop bitterness. Very drinkable with a pleasant dry finish. On tap at Dock Street Brewing in Philadelphia, PA. This one pours a moderately dark brown color, with a small head, and a good amount of lacing. This smells like moderately roasted malt, earthy hops, and chocolate. This is fairly lightly flavored, but it’s creamy and drinkable so I’m still digging it. There’s a nice roast character, with a mild hop flavor, and a hint of bittersweet chocolate. This is medium bodied, a tad thin, with a creamy finish. This was passable and drinkable enough, but it seems like it was brewed so as to not offend anybody. Pours appropriately for Thebes style. Smells ok, but kind of light and bland. Taste is same...mild coffee, mild roasted malts. Mouthfeel is a touch dry for the low ABV. Look, I know porters are different than stouts, but there seems to be a trend of coffee porters that seem designed to be quaffable and inoffensive and it is not my thing at all. Exceptional Local Brewery making an exceptional beer. I look forward to their releases regularly and this is no exception. Delicious. Notes from 11/28...pours dark black with thick creamy foam. Roasted coffee nose that is very aromatic. Smooth creamy mellow bittered taste. Clean milky finish. Chocolate in the conclusion as well. Damn good.